However, St. Thomas affirms that worship is due, in the first place, to God alone – i.e. we worship only the Divine Essence (The Most Blessed Trinity) for its own sake. However, the Common Doctor rightly asserts that we worship also the flesh of Christ our Savior, not because the flesh is itself divine, but because this sacred flesh has been hypostatically united to the Divine Essence through the Person of the Word. In this respect it is clear that we worship with latria what is joined and united to the divinity in the work of our salvation. But the Cross was most highly and perfectly united to the Person of Jesus in the plan of salvation – for it was through the wood of the Cross that our Savior redeemed us. Moreover, this wood has been saturated with the most precious and holy Blood of our Lord. This same wood has borne the limbs of Christ and was sanctified by contact with his Body. Therefore, from among all relics – and even those other relics which are connected with Christ himself (e.g. the Shroud of Turin) [and, even though these relics may perhaps also be worshiped with latria] – the Cross deserves special veneration and worship as having been uniquely united to Christ Jesus in bringing about the salvation of the world. This special and unique role of the Cross is proclaimed by the Church when she says: “We worship you O Christ and we bless you, for by your holy Cross you have redeemed the world” – Holy Mother Church does not speak about any other relic in this manner. Additionally, the Cross deserves special veneration and worship on account of the fact that it is uniquely an image of Christ. Indeed, even more than images made after the proper proportions of his natural body – i.e. paintings, icons, and sculptures made after the physical likeness of Christ – the Cross is THE image of our Savior. More even than the image of The Divine Mercy, the True Cross represents Christ as his perfect icon. The Scriptures themselves testify, according to the interpretation of the Church Fathers and Doctors, that the Cross is the “Sign of the Son of Man” (cf. Matthew 24:30). Moreover, Christ is identified as “the one who was crucified” – though many events occurred throughout our Savior’s life, it is the crucifixion which really defines who he is for us. Therefore, more than any other image, it is the Cross which represents the Person of our Savior. The True Cross holds a particular place among all icons, since the Cross is identified with Jesus in a most particular way. Therefore, it is worthy of a higher veneration and even of worship, over and above every other relic or icon. The True Cross is the only relic which is given a special feast in the calendar of the Roman Liturgy. Ave Crux, spes unica nostra! – Hail, O Cross, our only hope! Thank you for a powerful analysis of why we worship the Holy Cross! "We preach Christ, and Him Crucified!" Did you pray before the relics of the Holy Cross in Rome, and do you have a reflection of that time you might share with us? God bless you, Father. I would also use the analogy to the Holy Name. Sure, it is just a verbal "symbol" of Jesus or God, constructed out of vibrations in the air or ink on paper...and yet I think people are a lot less squeamish about the idea that the Holy Name can be adored. Thank you for the excellent insight! I recently contacted you on the Ask Father Ryan section about this quote, but I wasn't sure if it went through and just wanted to further contact you. My apologies if I am being a nuisance or appear to be undermining your article, I simply do not understand how it can be that the cross is truly adored with Christ even though they do not share a substantial union in God. I am sorry if I appear to be attacking your post, I have the utmost respect for your work as you are a very wise priest who's service is very important to us lay persons and the Church at large. May God bless you richly for your hard work and in your vocation. I apologize for the continuing messages but it appears that you perhaps better explained about the veneration of icons of Christ and the Cross in your article for the feast of St. John Damascene ("Do Catholics worship icons? ", http://newtheologicalmovement.blogspot.com/2010/12/do-catholics-worship-icons.html) which I think might be helpful to include as a link in your post to help those of us who are really lost. It seems to me that it might be better said that an icon of Christ receives dulia as a movement to latria, adoration of God Himself above the icon. The Catholic Encyclopedia article though seems to say that the Second Council of Nicea still states that latria to the true cross would be inappropriate. Sorry if I am a nuisance. I'm not sure why the comment did not go through on the "Ask Fr. Ryan" page, but I am delighted that you brought it up here! Do not worry at all about asking questions ... and, if I do not respond satisfactorily, please do ask again! You are correct that the Catholic Encyclopedia is a bit argumentative, but I see the article as still fairly open to the traditional Thomistic view. 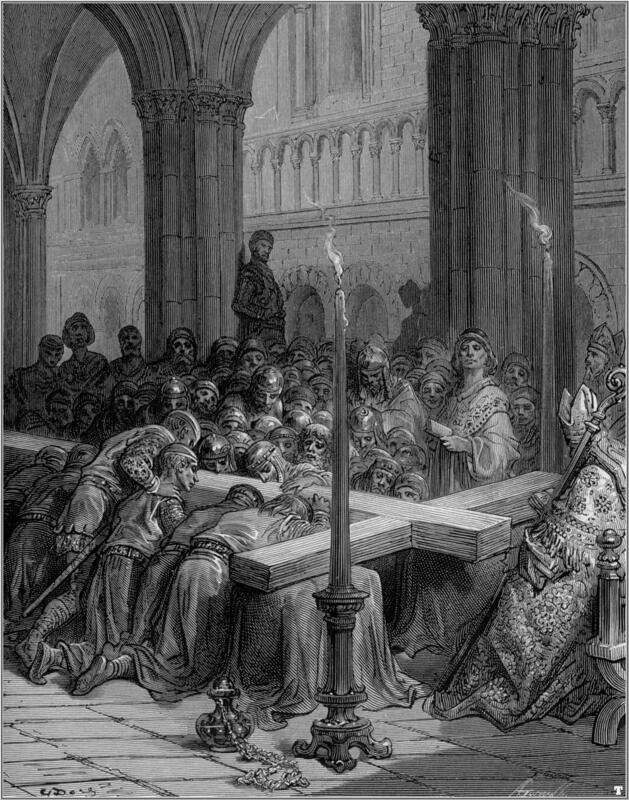 The key (it seems to me) is to reconcile the Liturgy of the Church -- which very clearly states that we worship the Cross -- with the definitions of the Ecumenical Councils -- which say that we give the Cross veneration. It is important to recognize that different Councils in different ages used words to mean different things. Hence, Nicea I seems to identify "hypostasis" with "ousia" thought in later theology and Councils these are used very differently: hypostasis means "Person", while "ousia" means "nature". But Nicea I seems to anathamitize anyone who says that the Sather and the Son are not of the same hypostasis -- but we now state that they are different persons. In other words -- we have to be careful about getting too tied to a literalistic or fundamentalist reading of the texts. And what is the theology of Icons in Nicea II? That the honor/worship given them passes on to the person -- so, if we worship God with latria, then (as the Liturgy and St. Thomas also affirm) we worship the Cross with latria. I've thought about it a bit over the past month, though I think it'll take me some more months of ruminations and prayer. I'm not totally sold on worship of the Cross with latria as an adoration of God. I think I understand a bit better that the veneration goes from the object to the person exemplified in the object and so it may make sense that the Cross receives a sort of latria not as directed to the wood but as directed to Christ signified in the Cross. This is a bit complex for me, though I do enjoy the study of theology it can be difficult to put these difficult concepts into an honest prayerful life of devotion. I will admit that I've felt a wince when I see an image of a saint or Christ treated without honor or good treatment (I think I understood this before I even knew about Nicea II), though I think I would wince less if the true Cross were to undergo some damage than perhaps to see Christ Himself in the Eucharist drop from the paten. I do not know if this lessens the argument about latria directed through the true Cross to Christ as opposed to latria through the accidents of the bread and wine to Christ who is truly the substance of the Sacrament present, though I'm not quite sure if this is right. I will pray on the matter Father. Thank you very much for your help, and my apologies on not getting back to you immediately, I've been very busy in college this past month. Deus gratias! God has led me to the teaching of the Church in fuller clarity, it is true what you speak of that we give latria to the Cross and other icons of Christ because the latria is not towards the icon itself but the Prototype, that is when we see the icon we are in per se a discourse with the subject of the icon not the wood or paint or pieces of glass. The veneration given to the icon passes on to the Prototype. I saw so clearly the logic that you had given me but I misunderstood the full meaning and the implications in the lived life of prayer that this meant. I am taking a course here in college on sacred icons in the Byzantine empire and they have helped me see the Way. I have a number of images of Christ in my dorm room but they are somewhat neatly tucked away in a drawer for personal devotion. However I have a number of articles containing images of Christ from the previous course I took on Byzantine art history (theology was not much covered, which I am getting to see now this quarter). May I ask your pastoral advice Father about what to do with these images. They sit in a heap currently on my floor and I think at times I had misprints of articles that included images of holy saints that I had recycled or thrown away. Ought I to do penance for this? I know in my heart I had some realization that it would not be good to do so, but was not sure of all the ramifications of doing so. I was told that in the middle ages stealing an icon from a church or damaging an icon was a mortal sin and punishable by excommunication. Yet I was also told that under certain occasions icons were dismembered without any pain or thought of what it would mean as venerating the person depicted. If you could perhaps give me some advice. It would seem that I ought clean up my room and provide some sacred space for these icons that I possess. What is the proper means of disposing of icons (the articles that contain images of Christ from my classes) if necessary? Is it like disposing of worn out liturgical books, burning them or burying them? It seems to me also that considering the fullness of this teaching that it would be pious to also offer works and prayers of reparation for the misuse of Christ's name (as you pointed in another article) and the impious use of His icon (image) [both of which here at the University of Chicago is disgustingly rampant]. May God bless you with much grace for the salvation of your soul, surely He will grant you a reward for enlightening so many souls. Every time I remember this holy dogma of the Church I will try to say a prayer for you. It seems to me that an image of Christ or the True Cross which is an icon of Him since it is intimately related to Him in the sense that the True Cross points to Christ crucified and so the latria given to the relic is not honoring the relic but honoring He who is exemplified and signified in the Cross, Christ. The icon or the True Cross only signifies or discourses with the viewer point him to the subject depicted, the Person depicted. God be praised! What a joy it is to come to a fuller understanding of the truth together! Regarding how we should treat icons ... I would say that we must be reverent, but we also should avoid anything tending towards scrupulosity or superstition. It is not as though the person is "in" the icon or anything (I know you already know this!). When we worship, the veneration given passes to the person ... but it is not as though everything we do to an icon is an act on the person. Thus, we do not need to act as though (just because an icon of St. Athanasius is in our room) the saint is really present there ... if we walk by the icon without saying "Good morning", we give no slight at all to the holy Saint. Likewise, then, when it comes to the disposal of icons. If we do it with reverence, there is nothing to fear. Same for having icons around the house (and even in stacks) ... nothing to worry about here ... so long as we do nothing out of disrespect and do nothing in itself disrespectful. There really is a subjective element here ... it is only when we use the icon as an icon, specifically to represent the person to us (either in prayer or in an evil act) that our actions pass on to the person. Hence, we just want to be sure to pray well, when we do pray with the icon -- and, of course, never do anything disrespectful to the icon (especially not with the intention of disrespecting the saint). The clarification is very helpful. It certainly is quite a peculiar thing indeed regarding the theology of icons. You're certainly very right about the person not being in the icon, that would I think be closer to the pagan idea of idols. What prayers can I do on the 14 September for the Exaltation of the True Cross? I have recently begun serving in a parish that has a relic of the True Cross. Since September 14 falls on a Sunday this year, we have an unusual opportunity to teach about and foster devotion to the Cross. How can incorporate the relic into the liturgy? Carry it in procession? Bless the faithful with it? Offer it to the faithful for their veneration? How would it be displayed during the Mass? How and at what points would it be censed? I'd be grateful for any guidance you can give me.